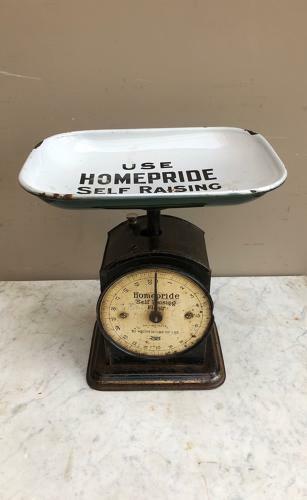 Early 20th Century Advertising Kitchen Scales HOMEPRIDE SELF RAISING FLOUR. Advertising on the Scale Face and the Enamel Pan. Fully Working. Weigh up to 20lbs. Heavy but can be posted Parcel Force 48 for £15.